Some of the winter travel items I carry in the trunk of my car. This is the “kitchen” and “furnace”. I grew up in Colorado where strange weather can strand you in any month of the year. Even though it is rare, I’ve seen blizzards in the Colorado high country in July. So I learned to carry some safety essentials when doing winter photography in remote locations. You never know when you might be stranded for several hours, a whole day, or longer, until the blizzard abates and someone can come find you. 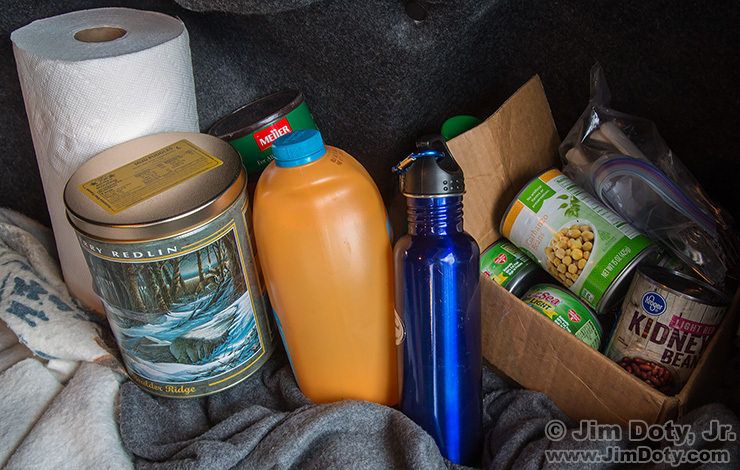 This is what I carry in my car when I hit the road in the winter and pretty much any time I am going to be in the High Rockies. I include a few winter travel tips, too. This is one of a series of articles on winter photography (links below). Keep your gas tank above half full. If you get stranded for hours (or longer) you will be thankful for every drop of gas you have in the tank. Sleeping bag, three blankets, and two pillows. It is nice to be able to wrap up and stay warm. Candles and matches in a metal can. You don’t want to run the car all the time to stay warm. And what if you have car trouble and you can’t run the heater to stay warm? Burning one candle at a time inside a metal can (lid off) can provide a very helpful heat source. Think of it as your portable furnace. A large size coffee can is about the right size. Did I mention the can needs to be metal? You don’t want to burn a candle in a plastic container, and you certainly don’t want to burn an unprotected candle sitting out in the car. Two to three gallons of water. It is important to stay well hydrated. I carry enough water for two people since I am often traveling with my wife or out shooting with another photographer. Two to three days of food, a can opener, fork, and paper towels. You need to eat protein so your body can generate heat. Choose something non-perishable that doesn’t need to be cooked. I carry 6 or more cans of tuna and 6 or more cans of beans (usually black, kidney, or garbanzo). They are good sources of protein and they are filling. Choose food that works for you. I keep the fork and can opener in a Zip-lock bag. I carry enough food for two people. In a non-emergency situation and I am out shooting in the middle of no where the food also comes in handy as a quick meal when I don’t want to head back to civilization. A roll of paper towels. Good for all kinds of things in addition to cleaning up after you eat. In nice weather when eating outside, paper towels are my table cloth. Toilet paper. Just because. You will thank me some day (stranded or not). Flashlight and spare batteries. If the car battery dies in the cold it is nice to be able to see. You can also use the flashlight to signal search planes at night. Some flashlights (Fenix and others) have a built in SOS signal. Just put the flashlight on top of your car and let it do its thing. Spare shoes, coat, and clothes. What if you get wet? Dry clothes are a big plus. A satellite communicator with spare batteries. There are a lot of places photographers go where there is no cell phone signal. If you need help, a satellite communicator can call for help from anywhere on the planet. A severe storm might interfere with satellite communications, so all of the above items will keep you alive until the weather breaks so you can use your satellite communicator to call for help. The satellite communicator is in my photo backpack so it is with me when I am away from the car. If you are running the car motor periodically during a snow storm to use the heater (don’t run it all the time), get out once in a while and make sure snow doesn’t pile up around the exhaust pipe. People have died from poisonous gases when the exhaust pipe couldn’t function properly. Keep one window open just a bit when running the car heater in a non-moving car. I provided a few links below to some articles that suggest some additional commonly recommended items (jumper cables, sand for traction, shovel, etc.). There are some survival sites that recommend enough gear to keep a platoon alive for months on the frozen tundra. That may be more than you want or need to keep with you. You need to decide what works for you. In the photo at the top you can see my food box, two one-gallon jugs of water (the bottle with a green cap is barely visible behind the box), a blue water bottle I can hang on my waist or backpack when hiking, two metal cans with candles and matches, a roll of paper towels, and parts of two blankets. The other items on my list (including two more water bottles) are elsewhere in the trunk. Originally posted January 17, 2017. Updated and re-posted November 29, 2018. Updated January 2, 2018.